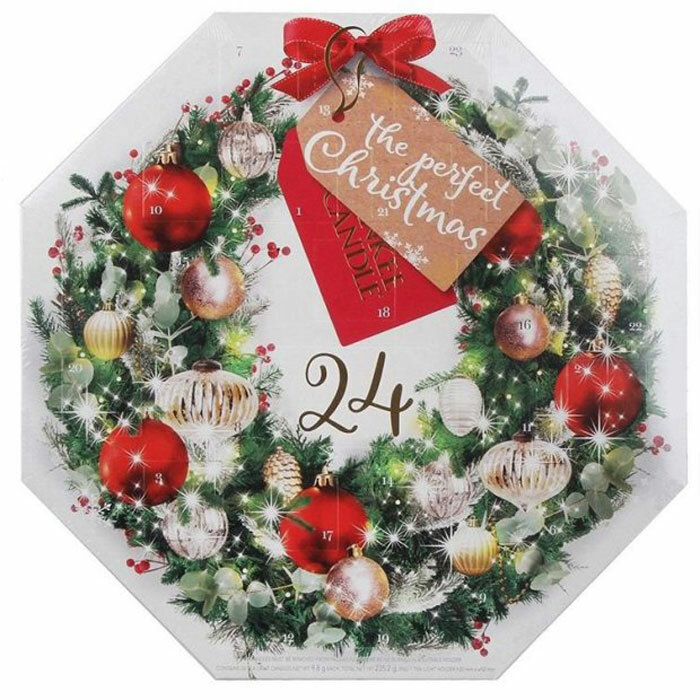 Yankee Candle ® 2017 Advent Calendar in Wreath Design Box offers a delightful hanging or standing Christmas advent offering 24 doors each with a surprise seasonal scented delight. Countdown to Christmas with this special 2017 Yankee Candle Advent Calendar. Every advent day reveals a new Tea Light candle in one of an array of seasonal scents and a special scented treat on the 24th of December! Delight and bring the light into the Winter nights, with a new candle each day to celebrate the joys of the Festive Season. Yankee Candle have given a sneak preview of some of the signature secret scents to be expected throughout the wreath advent doors. Festive scents will include the popular scented delights of ‘Winter Glow, ‘Snowflake Cookie’, ‘Sparkling Cinnamon’, and ‘Macaron Treats’, as well as festive scents such as ‘The Perfect Tree’ and ‘Spiced White Cocoa’.